.....and today, like most days i am packing from what i haven't even unpacked from my last teaching trip!! But...i can honestly say i am loving every single minute teaching on the road this year! Well, maybe not the time when i missed connecting flights and arrived at my destination 7 hours AFTER i was supposed to teach a class? Stuff happens, when you've traveled all over the country, on 36 airplanes since January 10, 2013! 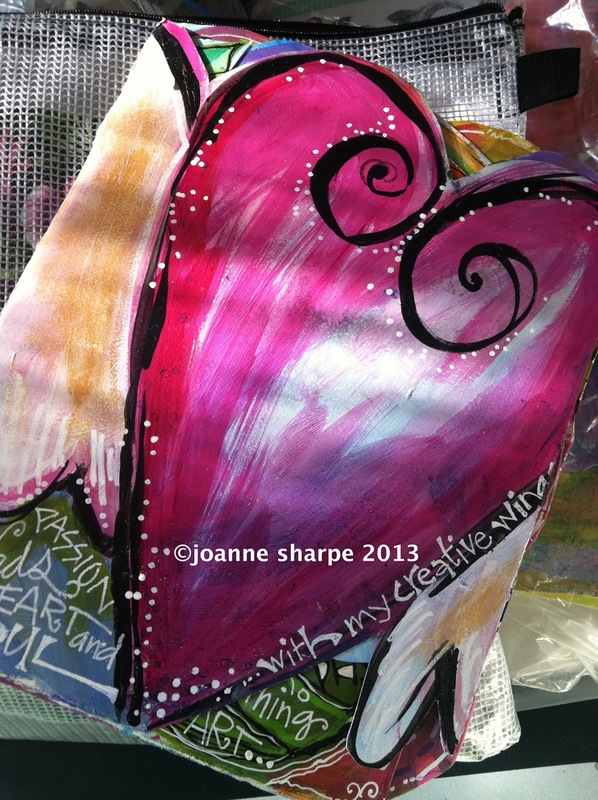 This is my "heart with wings" painted journal that i am using for class inspiration in my workshops. It's symbolic of my life, taking my passion and flying creatively and literally all over the country. It's bliss, creating, painting, journaling, sewing, laughing, sharing and nurturing new friendships along the way. The first half of this year has been such a whirlwind, and i am intentionally making myself embrace every single moment wherever i am. Having raised my awesome four kids in so many busy years, carpooling, going to sports and school activities, etc., i was always a spaz, in constant motion ready for "the next thing to do". At this point in my life, (now that the kids are grown and on their own) i've forced myself to truly "just be", be present in right now, and not worry about what is coming next, what i have to do, how busy i am. Because if i get caught up in all that my head will explode! 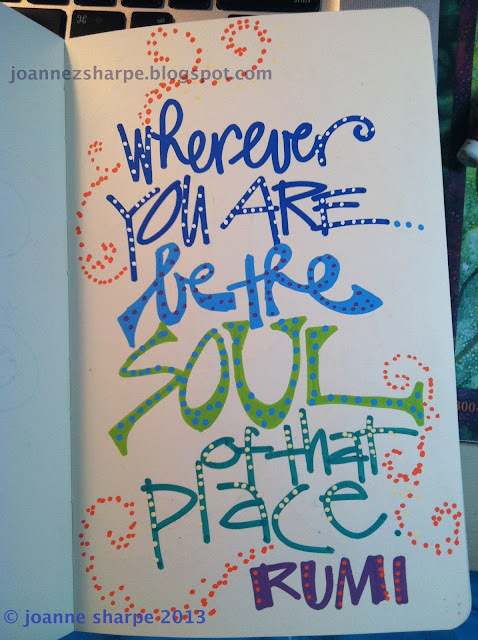 Making myself 110% present, I am so very blessed each and every time i schlep way too many art supplies, and set foot into a classroom where eager, sparkly souls are eagerly waiting to put on their own creative wings. Being a "travel teaching empty nester" is such an honor and privilege. I can share my passion for art and creativity and give wings to others. I embrace every destination and venue, stop, breathe, "just be" and cherish the moments. From the bottom of "my heart with wings", I want to thank you if you've taken my classes and workshops this year. And, you can check out my travel teaching schedule tab at the top of the blog and see if i'll be in your area soon. Join my creative adventures and let your artsy self fly! More than likely i will be FLYING to meet YOU! Congrats to "Sandy" who left this comment and is the random winner of the TAP Class with Lesley Riley. This is such a wonderful idea! Can't wait to try it. Just think about the amazing quilts, table cloths and tote bags we'll all make. Nice for a new baby with Grandmas art welcoming. Sandy, email me (jzsharpe@yahoo.com) with your email address and i will connect you to Lesley for your class prize. Thanks to everyone who left comments. Do you know TAP? I'm sharing today's post for my friend Lesley Riley who invented this amazing product to transfer artwork or photos onto multiple surfaces. She has a cool new online class about TAP that will bring your mixed media art into another dimension. I can't wait to mix my artwork with fabric and my free motion sewing. As shown in the top photo, you can even draw, marker, and PAINT on the TAP paper and transfer those images! 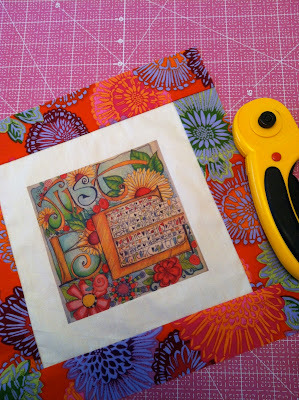 I am having a ton of fun experimenting and made a print of my very favorite piece of art onto fabric and combined it with some of my favorite colorful designer fabrics. ...can't wait to quilt this little treasure. 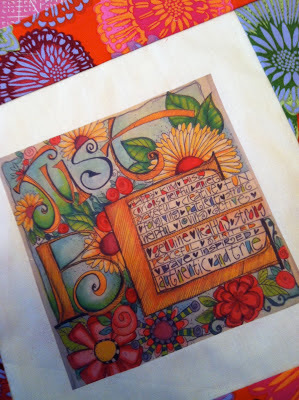 You can learn more about this cool product in Lesley's new class that is a true mixed media art adventure. 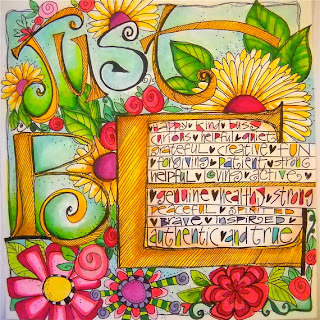 You can even WIN a spot in Lesley's class by leaving a comment here on my blog or the blogs of my other art friends listed below. Let's get TAPPING!! What would you do with TAP paper? Leave me a comment below and you can WIN a spot in Lesley's class! I draw a winner and post it here on July 10th. 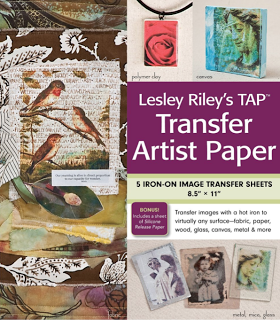 Leave a comment on Lesley's blog for a chance to win a 5-sheet package of TAP. Have fun hopping and TAPPING! !